I hope you don’t mind but this post will be a bit of a quickie. You see, I need to go and pack. And these tender little beauties are going in the hand luggage. Some of you reading this may be packing too, Perhaps you are jetting off to some island to laze around and sip rum punch, or maybe you and your family will be threading your way through the queues in some exciting theme park. I however am packing to go to London. Not to shop (although I will definitely squeeze a bit of that in) or go to the theatre. No, I am down to attend my second Food Blogger Connect, and I am SO excited. Last year I was scared-excited. This year I am just excited-excited. Which is the same thing, but with less nervous sweating. Not a good mental image in a food blog, but I like to tell the truth. Any of you who were kindly reading me last October may recall a rather long post reviewing my weekend at FBC. It was beyond my rather pedestrian imagination. And this year promises to be even better. To wit, we are getting to press the flesh with Mr American in Paris himself, the wonderful David Lebovitz. There is the chance of winning a 15 minute one-to-one chat with David about how to improve one’s blog. Which sounds terrifying but probably a game-changer for the lucky winner. 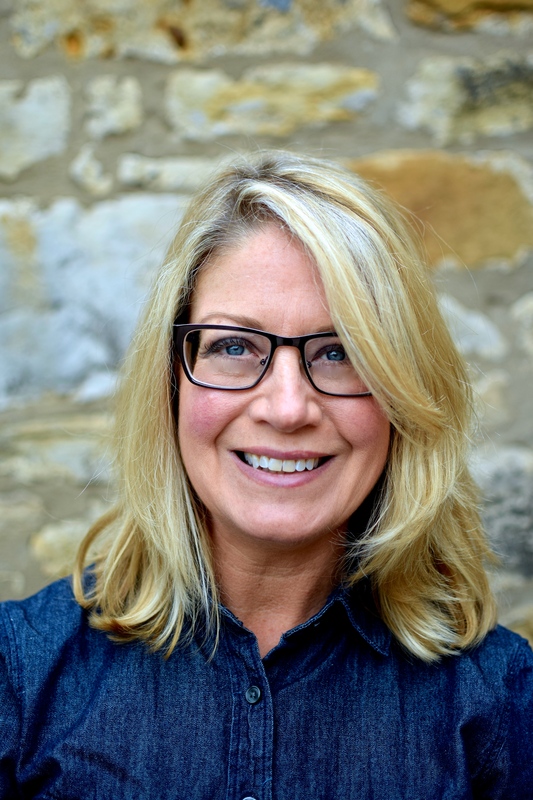 Another highlight will be seeing fellow FBC alumni Ren Behan and Karen Burns-Booth on the podium sharing a panel discussion with Sarah Cook of BBC Good Food magazine on how to get published in magazines (I will be taking furious notes: Why didn’t I do shorthand!). I adore these bloggers as people and as wonderfully good examples of how to run a compelling, must-read blog. And of course, there will be -ahem – serious and academically-rigourous attention paid to the art of eating. I have lost count of the number of folks and companies lined up to help us expand our waistlines. But I am especially looking forward to sampling from Ren’s pop-up Polish Kitchen. Her website is already making me want to book a second holiday to Krakow. So, the muffins. Which I will sneak into my miniscule Easyjet handluggage, along with a little tub of my butternut squash and almond dip and some homemade pitta chips. Anything to avoid getting hungry enough to buy one of the airline’s extortionate ‘snack packs’ (full of cr*p and more cr*p). I just hope my little healthy snack pack doesn’t get confiscated! What foods do you pack to avoid airline/train/service station ‘food’? 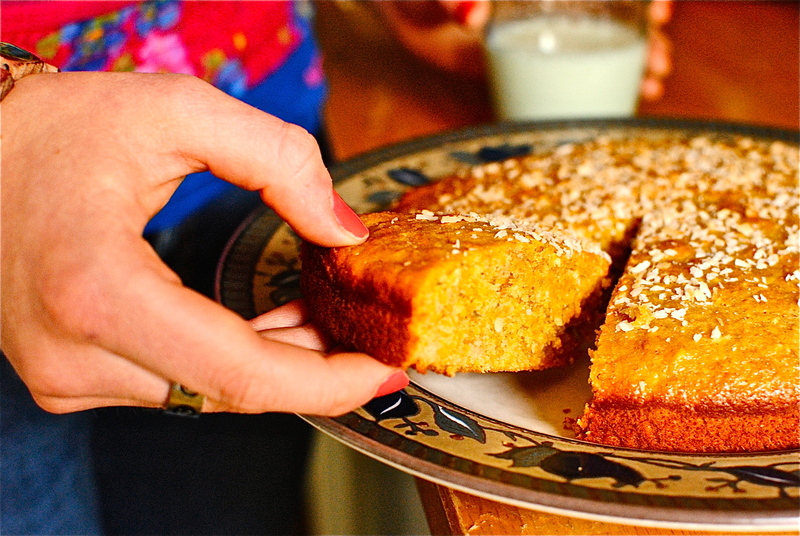 This is a riff on an old recipe of mine, Carrot and Marmalade Cake. NB. Trade the coconut for plump raisins or, what the heck, put them both in. *If you don’t have self-raising flour, just add an extra one and one-quarter teaspoon of baking powder (total) to the flour mixture. Oil a 12-hole muffin tin (I tend to make them smaller and use an extra 6). You could also line the holes with squares of baking paper (so they look like the muffins you get in coffee shops) or regular muffin tin liners. Preheat your oven to 180C/350F. Sift together the flours with the baking powder in a large mixing bowl. Stir in any bran that remains in the sieve from the wholemeal flour. In a separate large bowl, whisk the eggs with electric beaters or stand mixer until light and fluffy, then whisk in the oil and sugar until thickened and leaves a trail when the beater is lifted. Add the remaining ingredients and mix well. Fill each muffin hole evenly and bake in the preheated oven for 18-20 minutes, or until well-risen and a toothpick inserted comes out clean. If you want to add coconut to the top, do this about halfway through the baking so as not to burn the delicate coconut, but just give it a lovely toasty tinge of gold. Let the muffins cool in the tin on a wire rack and eat immediately. Or store for a few days in an airtight container. You could always go a bit fancy and extra-sweet by spreading over your favourite cream cheese frosting, or one such as this vegan one from food.com; or a classic cream cheese one from cook.uk. I like to keep them ‘plain’ for my nutrition classes and serve with fresh fruit. Makes 12-18 muffins or two small cakes (I don’t think this would be as good if made as a big fat cake). As usual, I am sending this over to Mark at Javelin Warrior’s Cookin’ W/Luv Made With Love Mondays. I got lucky as last week his theme was mango, but as this week’s is basil I am glad his themes are optional. I am not sticking basil in these! Have a great trip Kellie! When traveling I try to eat what I usually eat; staying away from fast food and fried things. 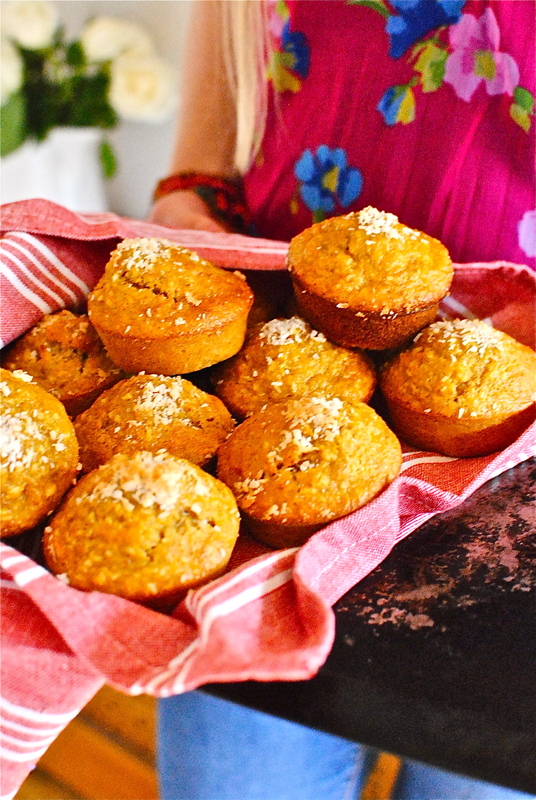 The Carrot Coconut Muffins sounds scrumptious, even if we make them for traveling to and from work! And fried things, and stuffed things, seem to be the only options. Best taking our own. This gets harder on double-digit hour travelling times though. I try and look out for a Chinese outlet and get broccoli tofu and rice. But even that’s not too good when an airport outlet is involved. G’day! Have a GREAT trip, true! 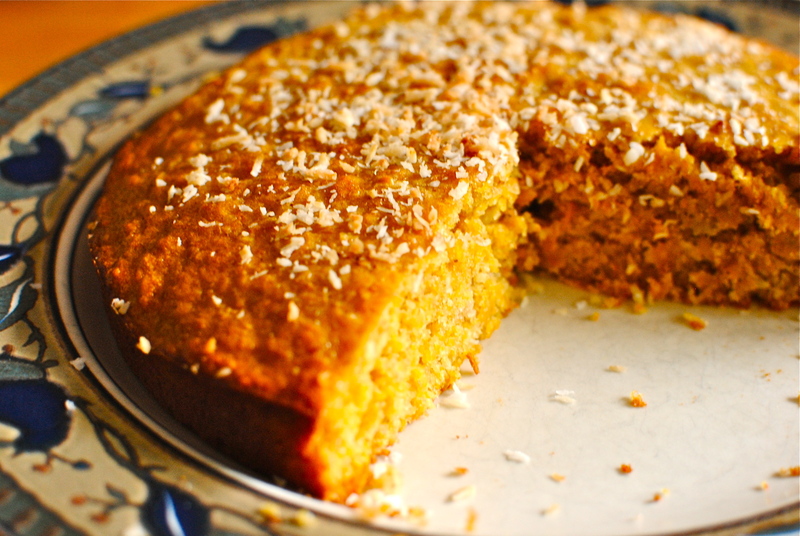 Love the flavor combination of coconut and carrot…and love your photos too! Cheers. Those are my Miss R’ s pretty hands in the photos. I’ve decided that until I can edit my wrinkly hands they are not being captured on film! Thank you Erica. They were especially good when surrounded by people buying rubbish on the plane. Oh Kellie, you are going to have a ball! 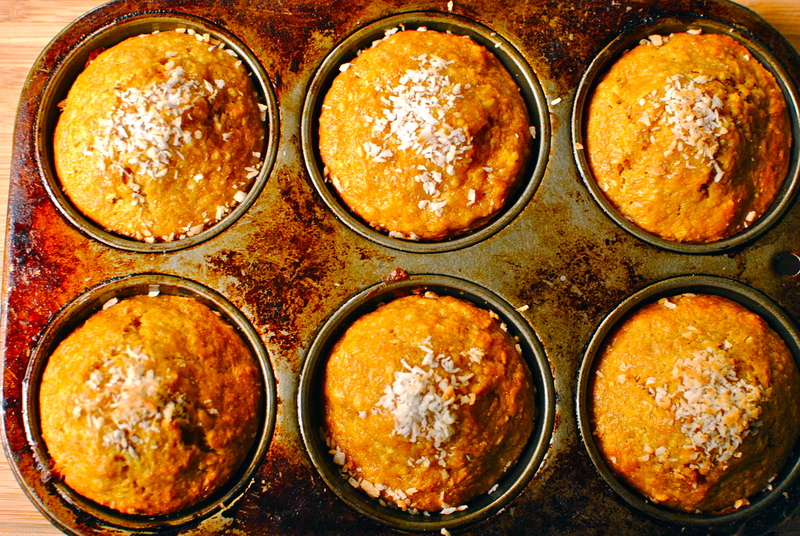 Love your muffins… might try them sans wheat flour. Re the airline food… I took cashews, fruit salad and yoghurt on a recent flight. Nothing worse than that stodgy, tasteless rubbish they serve! Kellie… another must try… I LOVE your blog!!!! It was a great to see you too, Laura. Yeah, I was pleasantly surprised at how much I already knew, but there is always room for improvement. Lots of food for thought. Ren &Karen were especially good. So proud of them! And yes, taking your own food on journeys is a must if you care about what you eat, and more especially if you have children. It also saves loads of money. 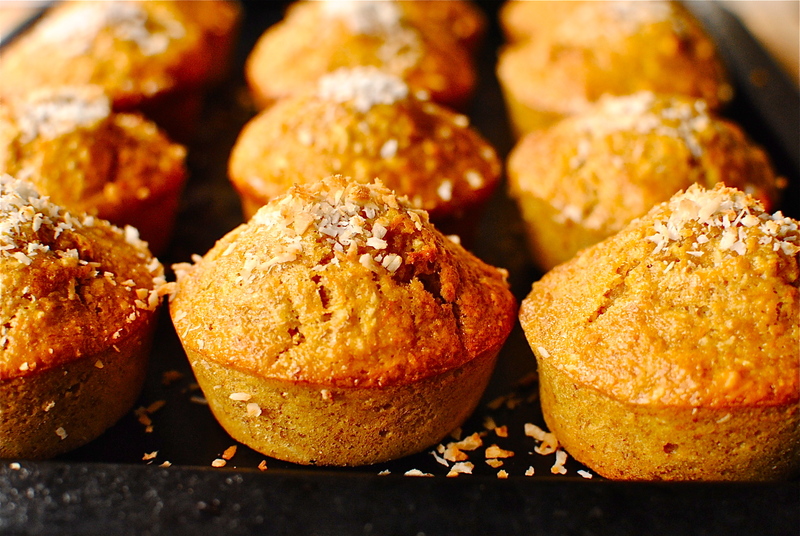 Savoury muffins are fantastic – light, neat and easy for children to eat. 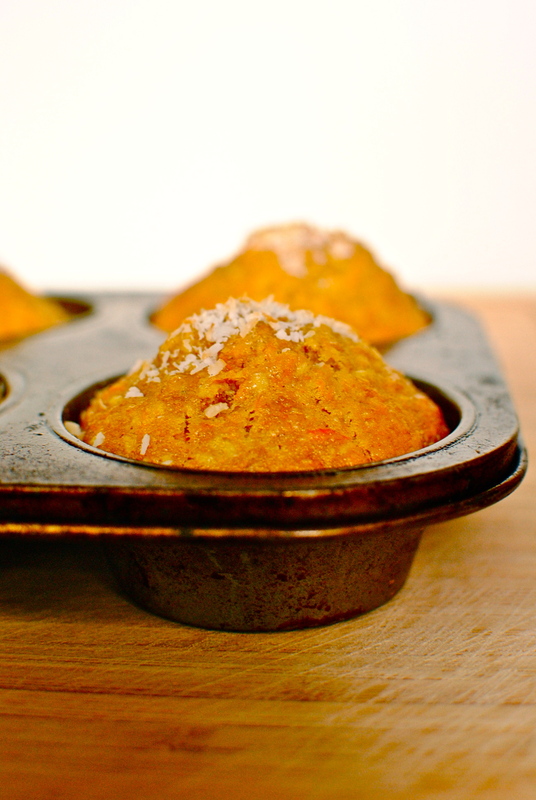 Chorizo and manchego corn muffins are good. Mmmmm, these look so good! I love the idea of using marmalade in there. I must admit, I’ve held off on playing around with coconut sugar. I know it’s got tremendous benefits as a natural sugar, but I have reservations on using it after reading about how ecologically devastating it can be, and the potential for economic devastation for future generations of coconut growers. I wonder how these muffins would hold up with some local honey or some good quality maple syrup swapped in for the sweetener? Perhaps I’ll just have to give it a go and let you know!